Tranmere dumped Stockport out of the Johnstone's Paint Trophy with a 4-3 penalty shoot-out win to set up an area quarter-final meeting against Bury. Both sides were limited to efforts from distance in normal time before spot-kicks were needed to settle the tie. George Donnelly missed the second penalty for Stockport, while Tranmere's takers made no mistake. And, when home keeper Peter Gulacsi saved from Adam Griffin, it confirmed Tranmere's progression. "We did make it hard for ourselves and Stockport were probably the better side over the 90 minutes. "We had three in midfield and we still couldn't get near them, so we need to do a bit of work on that before Saturday. "I don't know how many penalty shoot-outs I've sat through, but I think that's the first one that we've won." 95:06 Placed penalty taken by Adam Griffin saved by Peter Gulacsi. 94:40 Penalty scored by Sammy Morrow. Tranmere 4-3 Stockport on penalties. 93:52 Penalty scored by Greg Tansey. Tranmere 3-3 Stockport on penalties. 92:48 Scott Wootton scores a penalty. Tranmere 3-2 Stockport on penalties. Correction - 92:03 Penalty scored by Paul Turnbull. Tranmere 4-3 Stockport on penalties. 92:03 Penalty scored by Greg Tansey. Tranmere 2-2 Stockport on penalties. 91:47 Penalty scored by Joss Labadie. Tranmere 2-1 Stockport on penalties. 90:59 Spot kick missed by George Donnelly. 90:33 Ian Thomas-Moore scores a penalty. Tranmere 1-1 Stockport on penalties. 90:01 Robbie Williams scores a penalty. 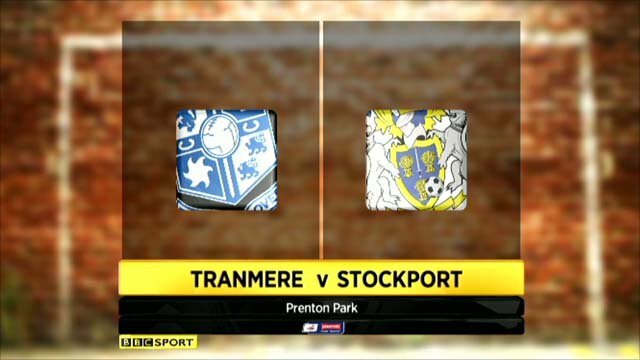 Tranmere 0-1 Stockport on penalties. 90:00+7:05 The referee calls the first player forward to start the penalty shoot-out. 90:00+3:14 It's full-time and the rules of the competition mean we go straight to a penalty shoot-out. 90:00+2:09 Sammy Morrow produces a cross, Mark Lynch makes a clearance. 89:12 The official flags Adam Griffin offside. Free kick taken by Peter Gulacsi. 86:58 Greg Tansey has an effort at goal from the edge of the area that misses to the right of the target. 86:21 Jordan Rose gives away a free kick for an unfair challenge on Dale Jennings. Free kick taken by John Welsh. 85:35 Outswinging corner taken left-footed by Adam Griffin from the left by-line, Effort on goal by Mansour Assoumani from deep inside the penalty area misses to the right of the target. 84:04 Centre by Mark Lynch, clearance by Ian Goodison. 82:48 Dale Jennings has an effort at goal from outside the penalty box missing to the wide right of the target. Inswinging corner taken from the right by-line by Ryan Fraughan, clearance made by Jordan Rose. 81:24 Greg Tansey is penalised for handball and concedes a free kick. Direct free kick taken by John Welsh. 80:47 The ball is swung over by Maximo Blanchard, Matthew Glennon makes a save. 80:15 Substitution Jake Simpson leaves the field to be replaced by Daniel Rowe. 78:04 Scott Wootton is flagged offside by the assistant referee. Direct free kick taken by Matthew Glennon. 77:23 Corner taken by Ryan Fraughan from the left by-line. 77:15 The ball is sent over by Zoumana Bakayogo, clearance made by Mark Lynch. 76:26 Substitution Greg Tansey is brought on as a substitute for Anthony Pulis. 75:52 Unfair challenge on Mansour Assoumani by Ian Goodison results in a free kick. Free kick taken by Matthew Glennon. 75:20 Robbie Williams gives away a free kick for an unfair challenge on Ian Thomas-Moore. Free kick taken by Ryan Fraughan. 75:20 Booking Booking for Robbie Williams for unsporting behaviour. 74:32 Substitution Cameron Darkwah on for Wesley Fletcher. 72:07 Ian Goodison gives away a free kick for an unfair challenge on George Donnelly. Direct free kick taken by Mark Lynch. 70:45 Inswinging corner taken by Jake Simpson from the left by-line played to the near post, Ian Goodison makes a clearance. 70:36 Robbie Williams sends in a cross, Scott Wootton makes a clearance. 70:26 Mark Lynch crosses the ball. 69:28 Jordan Rose concedes a free kick for a foul on Ian Thomas-Moore. Ryan Fraughan restarts play with the free kick. 68:58 Anthony Pulis has an effort at goal from just outside the box which goes wide of the left-hand post. 68:15 Shot from outside the area by Joss Labadie misses to the left of the goal. 67:48 Dale Jennings delivers the ball, Ryan Fraughan has an effort at goal from just inside the box that misses to the left of the target. 66:37 Substitution Ryan Fraughan on for Liam Darville. 66:20 Headed effort from close range by Ian Thomas-Moore goes wide left of the target. 66:02 Joss Labadie takes a shot. Save made by Matthew Glennon. 65:35 The ball is crossed by Liam Darville, Mansour Assoumani manages to make a clearance. 65:20 Mark Lynch gives away a free kick for an unfair challenge on Dale Jennings. Dale Jennings takes the direct free kick. 64:07 Outswinging corner taken right-footed by John Welsh played to the near post, clearance by Adam Griffin. 63:31 Foul by George Donnelly on Scott Wootton, free kick awarded. Direct free kick taken by Peter Gulacsi. 62:49 Adam Griffin takes a inswinging corner from the right by-line played to the near post, Peter Gulacsi makes a save. 62:39 Adam Griffin crosses the ball, clearance made by Dale Jennings. 61:41 Joss Labadie gives away a free kick for an unfair challenge on Jordan Rose. Matthew Glennon restarts play with the free kick. 60:30 Paul Turnbull takes a shot. Peter Gulacsi makes a comfortable save. 59:23 Robbie Williams takes a shot. Matthew Glennon makes a save. 58:50 Zoumana Bakayogo sends in a cross, save by Matthew Glennon. 57:37 Corner taken right-footed by Adam Griffin. 57:09 Adam Griffin sends in a cross, Peter Gulacsi makes a clearance. 56:36 Inswinging corner taken right-footed by Jake Simpson from the left by-line, Ian Thomas-Moore makes a clearance. 56:12 The ball is delivered by Jake Simpson, Ian Goodison makes a clearance. 52:59 Robbie Williams produces a cross, Ian Goodison makes a clearance. 51:09 Wesley Fletcher sends in a cross. Corner taken left-footed by Adam Griffin to the near post, Maximo Blanchard makes a clearance. 50:31 Inswinging corner taken left-footed by Adam Griffin played to the near post, Joss Labadie makes a clearance. 49:39 Anthony Pulis fouled by Joss Labadie, the ref awards a free kick. Mark Lynch takes the free kick. 48:44 John Welsh takes a outswinging corner from the right by-line to the near post, Maximo Blanchard takes a shot. Clearance made by Mansour Assoumani. 47:00 The assistant referee signals for offside against Ian Thomas-Moore. Free kick taken by Matthew Glennon. 46:03 Free kick awarded for an unfair challenge on Mark Lynch by Joss Labadie. Matthew Glennon takes the free kick. 43:51 George Donnelly challenges Zoumana Bakayogo unfairly and gives away a free kick. John Welsh takes the free kick. 42:50 Wesley Fletcher has an effort at goal from just outside the box which goes wide of the right-hand post. 39:43 Shot from outside the box by Maximo Blanchard misses to the left of the goal. 38:09 The assistant referee flags for offside against Adam Griffin. Direct free kick taken by Peter Gulacsi. 36:33 Adam Griffin delivers the ball. 36:04 Maximo Blanchard has an effort at goal from outside the area which misses left. 35:44 John Welsh produces a cross, Jordan Rose manages to make a clearance. 33:21 Dale Jennings fouled by Mark Lynch, the ref awards a free kick. Direct free kick taken by John Welsh. 32:23 Paul Turnbull gives away a free kick for an unfair challenge on Joss Labadie. Scott Wootton restarts play with the free kick. 31:26 Maximo Blanchard crosses the ball, save made by Matthew Glennon. 31:13 Ian Thomas-Moore crosses the ball, Jordan Rose makes a clearance. Correction - 29:21 Free kick awarded for an unfair challenge on Zoumana Bakayogo by Jake Simpson. Direct free kick taken by John Welsh. 29:21 Free kick awarded for an unfair challenge on Zoumana Bakayogo by Jake Simpson. Liam Darville takes the free kick. 28:44 The ball is crossed by Zoumana Bakayogo, John Welsh has a headed effort at goal from close range which goes wide left of the target. 26:07 Joss Labadie takes a shot. Save by Matthew Glennon. 25:14 The ball is crossed by Robbie Williams, John Welsh makes a clearance. 24:32 Jake Simpson produces a cross, Peter Gulacsi makes a save. 22:47 Centre by Adam Griffin. 22:06 Joss Labadie takes a shot. Blocked by Matthew Glennon. 20:35 Dale Jennings has an effort at goal from outside the area which goes wide right of the goal. 18:19 The ball is delivered by Dale Jennings, clearance by Robbie Williams. 17:26 Anthony Pulis takes a shot. Save by Peter Gulacsi. 15:53 Adam Griffin sends in a cross, Jordan Rose has a headed effort from close range and clears the crossbar. 14:39 John Welsh concedes a free kick for a foul on Paul Turnbull. George Donnelly takes the direct free kick. 12:27 Centre by Ian Thomas-Moore, Anthony Pulis manages to make a clearance. 10:14 Wesley Fletcher takes a shot. Save made by Peter Gulacsi. 9:43 Joss Labadie is flagged offside by the assistant referee. Direct free kick taken by Matthew Glennon. 9:10 John Welsh produces a cross. 6:50 George Donnelly gives away a free kick for an unfair challenge on Ian Goodison. Scott Wootton takes the direct free kick. 6:03 Wesley Fletcher takes a shot from just outside the penalty area clears the crossbar. 5:23 Joss Labadie concedes a free kick for a foul on Paul Turnbull. Matthew Glennon takes the direct free kick. 4:19 Robbie Williams produces a cross, Scott Wootton makes a clearance. 2:42 Inswinging corner taken right-footed by John Welsh from the right by-line, clearance by Robbie Williams. 2:19 Adam Griffin takes a shot. Matthew Glennon makes a save. 1:47 Adam Griffin fouled by Liam Darville, the ref awards a free kick. Jake Simpson takes the free kick. 0:39 Corner taken right-footed by Jake Simpson from the left by-line, Scott Wootton manages to make a clearance.